Nintendo Switch had an amazing 2017 - racking up some impressive sales figures over in Japan in the process - and it's continuing that positive trend this year, too. It's already overtaken PlayStation 2's Japanese year one sales, and now Nintendo has revealed the little hybrid hardware that could has become the fastest selling console in the United States... ever! With 4.8 million units sold that's one amazing achievement for Switch before its first year has even come to a close. The title was previously held by Wii, with its mightily impressive 4 million units sold. Fans across the country have experienced the joy of playing their favorite games at home or on the go. Now that many more people have received Nintendo Switch systems for the holidays, we look forward to bringing them fun new surprises in 2018 and beyond. So Switch is starting 2018 with some big milestones, and we can't wait to see what the next few months bring. Are you a Switch owner based in North America? What games sold you on the system? Now let's see what 2018 has in store. Is that only Nintendo consoles or including xbox and PS? Nicely done. Maybe next week the Switch will pass 15 million units sold. @SLIGEACH_EIRE And hopefully by next week! We started from the bottom now we here! @DanielRivers Fastest selling hardware ever says exactly what you think it says. With blockbuster hits like Vroom in the Night Sky & Troll and I, it's no wonder the Switch is doing so well. Nintendo to go third party. Do these people know that the Switch has no games? So it's all-time winning in Japan and the US. I wonder how it's doing in the UK? I know more than a few households who own more than one. The console lends itself to buying more than one. Hopefully now on Jan 11th we can get a better picture on what year two has to offer from first and third party. Well at least up until around E3 at least. Kirby should be soon, but would like to see if Yoshi is holiday 2018 or sooner. VC and paid online plans need to be made known. Perhaps a surprise rerelease like Smash 4 with all DLC and stages from both Wii U and 3DS with possibly a new character or two would be a good E3 release or even another remastered Zelda or Mario title. Also third party needs time to shine with more AS A and indie games to be aware of on our radar (hoping for Red Dead Redemption and others). First time I seen an article with no tags? As a US owner, I was sold on Zelda, Splat 2, Arms, MK8D, and the sheer potential of the hardware itself. I wasn't this giddy for a system release since the SNES. Me: I have a Wii U and a Switch. North Ameeican Switch owner here, 26 games purchased..I love my Switch, it is by far my favorite console. Whoa this is indeed huge to say the least. It's amazing to see how absolutely wrong all of the people who doubted the Switch are. Now let's see if Nintendo can manage to keep the momentum going for 2018. It’s a beast in Jap and US. Now time for Switchitis to infect the UK and get Ninty back on the map over here. Ps There’s a mistake in the article. It hasn’t overtaken PS2 jap lifetime sales but year 1 sales. Just saying. Great sales but bad reporting. “It has already overtaken PlayStation 2's Japanese lifetime sales” is fake news. It has overtaken PS2 FIRST YEAR sales. None the less a truly outstanding turnaround by the big N.
@JHDK True, and don't forget that Troll and I is multi-platform. It's also due to titles like The Life of Black Tiger that the PS4 has sold 70 million. What you said was certainly true of the Wii U but the Switch has been very heavily advertised so all credit to Nintendo for that. It's safe to say that anyone who remotely has any interest in Video gaming will know what a Switch is. North American and day one. What sold me on the Switch is that it's a Nintendo console and Zelda. I just hope the Direct that is coming will blow our socks off after a year with Mario and Zelda with new entries. I need more than Yoshi, Kirby, and WiiU ports. 1 Console per person, not per household. That’s why the Switch will break the Wii’s record (as long as they can keep giving us good unique titles). @DanielRivers @YummyHappyPills Article also says Switch has outsold PS2 lifetime in Japan. If the article is that screwed up why should we take the title as correct? There are no links anywhere in the article to back his claim up. @Hotfusion Yeah, new guy @dom gets cut no slack on that one. PS2 must be 10x that lifetime in Japan. Sad if took until post 24 for someone to point it out. "overtaken PlayStation 2's Japanese lifetime sales,"
It is a great achievement if it's accurate. Has me wondering about Gameboy and DS. Also, does "first year sales" mean 12 month or calendar year? B/c a lot of consoles launch in November so may sell less in 2 months, even with the holiday, then Switch has sold in 9. Guess I'll go do the research myself. @rjejr The source is a PR e-mail. You can see it on various sites. At E3 this year we'll see a new PlayStation that works both as a docked console and a handheld? Having Zelda at Launch and Mario for the first holidays will do that. Now let's hope getting all the fans on board this quickly is enough buzz to make the less Nintendo savvy among us notice the system. Being the fastest for the first year is great, but there's still a long road ahead. @rjejr Well I think the comparison they can only draw when they say first year is the nearly 10mo on the market as it was out early March through 12/31/17. They pulled off 4.8M sales in about 10 months, and in that time frame the Wii in that (or a year) did 4M units. It outpaced the Wii which is stunning. The Switch being popular where you live is not scientific proof that it is very successful in the UK. I will try to find an official newspaper article from late November 2017 that broke down sales of systems in the UK over the last decade or so. Yes, you are right, the Switch is doing far better than the WiiU but it is still massively trailing the FIRST YEAR sales of other previous consoles in the UK. Namely the PS4 and XB1 this time around. With three months to go for the Switch full year this is not going to change. Success is relative with the Switch (Nintendo) in the UK. Sony were pretty close to that already with the Vita TV, and with streaming PS3 and PS4 games to the Vita. They've been dancing around the concept, but Nintendo beat them to the punch with a simpler idea that focused on multiplayer and convenience. While also bringing the better games. I think I'm allowed to say that around here. Impressive. Any numbers on a global scale? Switch is trailing far behind Wii here in Scandinavia as well. They passed ten million in late November, but I don't think they've reached any sort of global record for first year sales yet. They have a few more months though, and I'm sure they will be patting themselves very loudly on their backs if/when it happens. Oh absolutely. I am definitely not defending the Vita TV. That's insane! Good for Nintendo. I was very skeptical when they said sales were going to be Wii-level success, but so far they've been right! Yeah I remember almost falling out of my chair when I saw Sony announce the PlayStation Move. I actually felt warm-faced embarrassment for them. I could not believe that they would so blatantly copy Nintendo's idea just because the Wii had taken off so well while the PS3 had not. I know people defend them because it uses a camera and is supposedly more accurate... but there is no denying that they brought it out to cash in on the Wii's success. It was a wand/remote controller that you hold in one hand and a navigation controller you hold in the other hand! I owned a PS3 and loved it, but I never even came anywhere close to Move. It even turned out that they would've done just fine without stooping to that level. And yet they chose to release the latest Animal Crossing game on mobile instead, which isn't drawing nearly the profits they hoped for either. Oops Nintendo?! I will help you out. Japanese lifetime sales on selected consoles. The DS is at 33m - This is the record sales figure. The GB/GBC is also at 33m - a little less than the DS. Usually sales are summed from the release date to first anniversary. Then there is the financial year that depends on the company and locale where companies speculate. For most of us and media however, now that it is a new year, it will be “sales in 2018” that matter. @chardir Are you kidding? They know what it is. Back in October I had to take a work trip to Germany and one of my transfer locations was London. I was toting my Switch around and playing anytime I had to wait around and in both countries I had people constantly commenting on it and calling it by name. They knew what it was, but I didn't see anyone else that had one. This year will bring Animal Crossing, Smash,Bayonetta 3, Pokémon and a brand new style of 2D Mario among many others. There will be a huge new IP that will be revealed in the Direct too . It's going to be a monster year for Switch I'm confident of that. Bought 3 of them. One for me, one for my son, and one for my best friend's nephew. Love playing console quality titles while at work when there's a break. @chardir Definitely not had this experience myself. @JamesR so the game of the year BotW counts for nothing? How about the fact that 4 of the top selling games of 2017 were on Switch? Still no games? @Fred13 Not kidding. That's an actual conversation I had the other day. I travel by train regularly. I always take my Switch. No one has ever commented on it and I've never seen anyone anywhere with one in public. Strangely enough I was having a chat on another gaming site not long ago with members from your part of the world that confirmed what you said. Generally speaking the USA and Japan are usually big Nintendo supporters. Bestselling consoles in USA history is the Wii (45m) and the DS (47m). This with the PS2 being the bestselling of all time globally. Europe (mainland) is very heavily PlayStation biased. There is that site that I will not mention here that monitors console sales (and although many mock their figures they are usually pretty close these days) that reinforces this. Switch sales in Japan and N America are astronomical whereas in Europe it trails quite significantly behind the other big two consoles, namely the PlayStation brand. This is something that Nintendo must look to balance out. @SLIGEACH_EIRE Did you end up getting a Switch, then? OK, got you. Yes, it is rather silly to indicate that people in the UK do not know what the Switch is. Hell, my mom knows what the Switch is and that is saying a lot. OK, that’s an exaggeration. She is however aware of a NEW console you can hold in your hand and play Mario on. The UK just rather other consoles at this time. I'm sure with the foot so firmly down in the US and Japan now, Nintendo is focusing on the spots where they're not typically that strong, which is probably why we're hearing about their recent efforts in Russia. It's my great dream that they would bring out some bigger guns for Scandinavia. I know great people at Bergsala AB, the Nintendo distributor around these parts, but their corporate doings are oftentimes mysterious to me. Typical NL cherry picking figures that look good for Nintendo. Of course they’re selling well in select backwaters like the US and Japan. Why aren’t they reporting the figures from Dagestan? Sony is outselling Nintendo 100x there! Bias. I demand NL focuses on figures that make the majority of readers here feel bad not good. Very impressive! I got BOTW on Wii U and waited to get a Switch for MK8D. I don't regret waiting, as BOTW didn't turn out to be my favorite game anyway, but I'm glad I didn't wait much longer. I knew the Switch would be worth it for me with Mario Kart, Splatoon, and Sonic alone, and that's just the first year! Can't wait to see how 2018 goes... really hoping for Animal Crossing! Geez, there's PushSquare for positive Playstation news. They are sister sites. I mean, after all, it's not like PushSquare mentions all of Nintendo's shining moments as a Playstation news site. Obviously, there will be a Nintendo bias on a Nintendo site. The Wii was supposed to have sold as well as it did because it appealed to casuals, whereas the Switch doesn't try to do that as much. Does this mean it's really liked by actual gamers? Man there’s a lot of talk going on around about the Switch’s sales. It launched not at the end of the year like other gaming systems and it’s missing some stuff that changed our lives on the Wii U. By my estimates, 1.4 million Switches were sold in December 2017 alone. @StuTwo You demand people to feel bad? It's true that Nintendo has on many occasions been relegated to picking arbitrary figures and adding a healthy dose of spin, just to have a positive sounding press release. @beazlen1 Yeah I noticed that too. Well spotted. You only have to go to Game or Sainsbury's etc to see why it's not that hot property here, barely any shelf space at all. Someone ain't doing their job! Joe where did you even find that qoute? I am an original gamer meaning I started gaming with the start of gaming. I have owned just about every system portable and home ever made. I always dreamed of continuous gaming and embraced concepts like N64 transfer pack and gba-cube cables. Sony did some usefull things with cross save/buy. Still the home/away dynamic was always limited to some games and less than seamless. Got Switch day 1 in the US and haven't played much else all year. Its a glorious thing to finally be able to Switch formats with my gaming instantly. This is the concept dedicated gamers always wanted. @Kentula - that was biting sarcasm there. The problem with Year 1 sales for classic consoles is that they have typically been staggered releases. That's why country specific sales numbers for Year 1 are being mentioned at this point. The switch (yet again) shows that good gaming doesn't need to be consumed by "speeds and feeds" numbers. Gorgeous games can be made at 720p as well as 4k. I hope we don't get the Wii effect with shovel 3rd party releases of crap that isn't very interesting. Feels incredible, after being told repeatedly how Switch was going to fail so hard. People were foaming at the mouth to see this console sink. It's lovely seeing them eat their words. I knew it was going to do at least somewhat well- it was too cool of a system not to. The ones who couldn't see that... it was because they didn't want to see it. You each eplied to different comments, but in both instances I think the joke went over your head. Both of those comments were meant to be sarcasm by the people who posted them. So, where exactly are those Switch and Nintendoomed naysayers hiding? Nope, no portal to 4chan here. Definitely beyond my initial expectations! And yet... I STILL haven't seen more than 2 people total using one in public in the Washington, DC Metro Area, frequently taking public transport. I saw plenty of 3DS users in public within the first year. What this tells me is that easily less than half of everyone buying the system frequently takes it out of the house and into public view. Or at least, that's how it is in the USA. Interesting that the premise it's sold on is as a hybrid, yet it's mostly used as a home system. I guess there's still a great desire for Nintendo home systems after all, but they're more likely to be accepted in a fully portable wrapper, rather than just partially portable like the Wii U. North American here. I bought on day 1 for Zelda and the potential future promise. I own a PS4, Xbox One, 3DS, and Switch, but the Switch is my favorite now. I tend to have down time at work and nothing makes the hours pass like playing on the Switch. I've bought like 30 games so far, but am currently in love with Xenoblade Chronicles 2. I'd sacrifice a body part for games like Persona 5 to come to the Switch. Haha! NA user here...I bought the Switch for Zelda, with the promise of Mario later. That said, the other games that came out of the woodwork this past year is astounding. Here's hoping 2018 has more surprises. Congrats Nintendo, back in style. Wikipedia states that the Switch has sold 10 million units as of December 12, 2017. @PlywoodStick I haven't decided yet, lol. Can't be arms, hands, or eyeballs though, I need them to play Switch! @QuickSilver88 Found it totally by chance paging through old EGM magazines (EGM Nº4, page 24, November 1989). You can find them on the Retromags site. I'm also from early gaming, playing since the Atari 2600 (favorite system: NES). The Switch software line-up reminds me a lot of the NES era, where EVERYONE ported EVERYTHING - you had PC ports, Arcade ports, rival consoles ports, even first party companies like Sega, NEC, Atari and SNK made games for the system. Not even counting the exclusives. Brilliant future ahead! @PlywoodStick "It's mostly used as a home system". Well....that's not strictly true. It may be true in your area that people aren't taking outside, but outside is not the only place the system can be portable. They could be using it portably indoors. Away from their TVs. @10-zx that’s worldwide, this is just in the US. @Hotfusion "The PS2 is 23m"
Thanks for that, I was so busy looking up GB and DS numbers I forgot about PS2 in Japan. I was fairly close w/ my 10x guess though. And it looks like the article has been corrected to reflect it's first year Japanese sales, not lifetime, so at least it's accurate now. @tanookisuit Thanks for the clarification about Switch selling 4.8m faster than the Wii. That makes sense. I'm still curious about the handhelds though, I spent about 30 minutes doing Google searches for Gameboy and DS but coudlnt' find the numbers. Well then it must be 100% accurate w/ no bias at all. And whether it's true or not I replied to you for calling the other guy out. "Fastest selling hardware ever says exactly what you think it says. He asked a legitimate question as this article contained no links, and you dismissed him by basically claiming the article "Said so" so it must be true. Which the author himself proved wasnt' the case by his assertion that Switch has outsold PS2 in Japan in the article. Seems like the general public people buying this machine don't give a damn about the power differential or what chip is inside it, they see the form and function and it seems to appeal to them. It's already given the Wii U a massive shoeing with very little effort. @PlywoodStick I'm amazed it's sold so well as well, mostly b/c it's Ntinedo so I figured they'd only make 3 million the first year to drive up the price on eBay. I dont' think it's as invisible as you've made it out to be though, in fact just the opposite. Oh sure, I don't think Iv'e ever seen one in public, mostly b/c I never leave my house, but it's a thing in the collective conscious. I've seen commercials for it on TV all the time. probably 10x more already then I've seen for all of Wii U in 4 years. All the Targets and Gamestops I go into have playable kiosks. (I leave the house sometimes.) The newspaper flyers have had way more ads for Switch than they ever did for Wii U, and bigger too, full or half pages rather than just a small corner. I've seen ads in movie theaters. It's been in plenty of "Best gift for the holidays" list. I haven't done any polls but I feel confident that after 9 months on the market way more people on the street in the US would know what a Switch was compared to a Wii U. So yeah, it's amazing it's sold this well, that Ntineod has made this many, and pushed it so hard, but I think them pushing it has helped sell it. Both for portable and home use. And while people will probably choose to use it 1 way or the other, the fact that it is a hybrid is a selling point, just in case people get in the mood to try something different. And Nintneod is pushing the hybrid nature of the Switch. In Japan they are pushing it as a handheld that does tabletop for 2 players. In the US they are pushing it as a home console. That's the benefit of the Switch for them, they made one console they can sell in different markets by focusing on different things it can do. So they are pushing it's hybrid nature, just not in the same place at the same time. As long as it sells and people buy the games Nintneod doesn't need to care how people are using it. But it doesn't surprise me you haven't' seen a lot of it on the DC metro. It's kind of expensive, and unwieldy, as a portable. And Zelda and Mario work better on the big screen, and I dont' know but I'll guess WiFi on the DC Metro is somewhat limited for matches in Spaltoon 2. All NYC mass transit advertises WiFi of some sort but I wouldn't' rely on it for gaming. Wait until the spring when the weather gets better, I bet you;ll see more then. No, no, NO. The Switch is a stupid gimmicky concept that will bomb and bankrupt Nintendo. Er, wait, no, I meant, the Switch launch lineuo is awful, only one good game, what were Nintendo thinking? Hang on, what I really meant to say was, its library is nothing but ports, so sad, what a joke. No, that wasn't it. Oh yeah, it has only sold to the Nintendo faithful, outside of the fanboy sites there is zero interest in this travesty of a console. Er, scratches on the screen? Oh, hell. The Switch will bomb in 2018, positively definitely this time. Because look at that horrible release schedule, there is NOTHING scheduled for the rest of the year! What? You say there's a Nintendo Direct in two weeks and a dozen new placeholder slots for Switch games on Amazon? 2019. Mark my words, the Switch will DEFINITELY bomb in 2019. Just watch. @Kentula to be clear. My post was not serious. @impurekind In November, it had sold 300,000 units here. With Christmas and sales now over, I'd expect about 375,000 units sold here. @10-zx it’s okay, easy mistake! @rjejr I agree that it’s not that invisible. I only have a handful of local gaming friends, but I will take my Switch to various social events in case there’s downtime (I love the carrying case I got with BotW) and almost always I get responses like, “Is that a Nintendo Switch?! ?” Almost always by people who are not gamers. And often followed by many questions about how it is and if they should get it, with added statements like, “I haven’t had a gaming system since the Wii/PS2/SNES/etc”. The biggest untapped market that can easily be reached right now is those who had game consoles 2 or more gens age but mainly just the popular systems, consumers who don’t follow gaming news, just popular news. And most of these people seem to know what the Switch is and are at least on the fence - I usually show them a couple games and they decide they may want to save some money for the system. And I do know people who have Switches (including people who aren’t really gamers), it’s just unwieldy to carry around everywhere (unless you’re like me) so you don’t see it, but it’s selling at a great pace still. the Wii u however was one massive depressing doom and gloomy generation for the big N that shouldn't of even happened...albeit a handful of rays of sunshine in between with a few signs of great potential for the wii u game pad...ultimately it was poorly thought out, advertised and some of nitendos key franchises were pissed on such as star fox, paper Mario ect solely because they KNEW console sales were so pathetically low they never put in their all. Now if ONLY they ditched gyro pointer controls and created a new joycon with pointer sensor bar wii controls...because let's face it you're not going to get the reliance and pin point accuracy with those annoying drifting gyro controls. Switch sales in the UK are above 500,000. @westermac To be fair, third-parties took massive losses on the Wii U and even previous Nintendo home consoles like the Gamecube and even Wii. So, I'm not shocked some of them were unwilling to get onboard until they saw how the Switch did in the market. @ShadJV Your situation seems like what's happening, it's out there and people know about it. That's a lot more than ever could be said about Wii U, Nintendo really did learn something, marketing helps. They already knew portability helps, Gameboy, DS, 3DS, they practically sell themselves. Switch could outsell 3DS, that will be interesting to watch in a few years. Wow, that's incredible. Now the Western 3rd parties really have no excuse to ignore the system. So I finally saw the NoA tweet from 7 hours ago putting this article into perspective. It really is a great milestone, and it gets people talking about Switch in terms of Wii, not Wii U, so that's a welcome change. The wording and the numbers still bother me though. 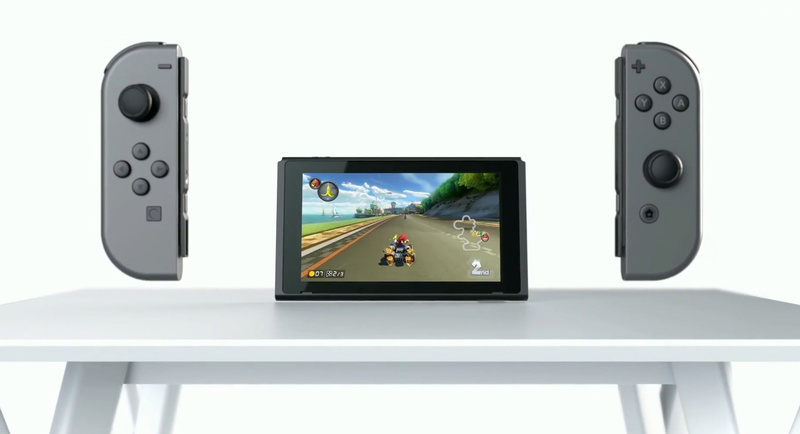 Several non-gaming news sites have said "home console", but none have mentioned portable sales, so Switch could have that record as well, Google searches have proved fruitless. But the "fastest" still bothers me, b/c nobody in their right mind would ever talk about being the fastest to 4.8 million. Fastest to 1m, 5m, 10m, but not 4.8m. What the Switch has done is sold more consoles in its first 10 months than any other console in their first 10 months, beating out the Wii which sold 4m. But it's not so much the fastest as it is the best selling in it's first 10 months. And there in lies my 2nd problem, why 10 months? Wii, and most other consoles, launch in November. Their first 10 months end in August, most of their sales fall during the launch and holiday period. Switch had a great launch in March and then 10 months ends with the holiday. So the 10 months seems kind of a force ending. Like deciding a football or basketball game at the end of the 3rd quarter. So yes, Switch has sold more in its first 10 months than any other console (possibly limited to home) in the US. And that is a great feat, and I'm happy for it. But 10 months cuts off most other consoles at the end of summer. It will be interesting to see where Switch sales stand after it's first 15 months compared to the Wii first 15 month when Wii will have 2 holidays under its belt and Switch will be looking at winter and spring sales. @Azooooz There is a report from an analyst saying that it already has passed 15 million before the end of 2017. Top chart is JP, next is the US for this discussion here. GBA is a little tricky on their chart because of overlap on Nintendo quarters starting in April 1 of each year as the JP GBA came out in June in the US. 7.57M is what they show for the first year. Initially disappointed on launch day, the Switch has had an amazing 2017!! Switch owners are getting blasted with quality indie choices, a nice selection of retro classic games and quite a few 3rd party surprise announcements! Just for a laugh, the Wii U reached 4.8 million units sold sometime in December 2015, over 3 years after its launch. The Wii U has sold below 6 million units LTD in the US. The Switch will pass it up by the middle of this year. The 3DS has sold just under 21 million units LTD in the US. Passing the 3DS will be much more challenging, but it should happen, though it will take several years. Microsoft copycat Kinect from PS2 Eye Toy. Sony copycat Moves from Wii, copycat Streaming with PS Vita from Wii U gamepad concept. PS5 want to copy from Switch ? Sony today = Stinks ! Even their games that utilizing Moves are just Niches. Sony just copycat, provide Crappy games, Ruin the business. I wonder if this concerns Sony and Microsoft or do they still see Nintendo as occupying a neighboring but not overly overlapping market? @rjejr It's being reported on by everyone everywhere and the writer made a typo. Switch is going to blow up, this is defo going to be the better year. All the features that were missing will arrive, the virtual console, the apps and without a doubt they going to have some big surprises and I think they will sort out their online issues. Nintendo is a different animal now, behind the scenes and with the switch, so much has been learnt and accepted that I don’t think they are going to mess up in any way shape or form. They now know what works and they are going full throttle, and all this without eve mentioning some of the awesome games in the works. I’m betting all of it. @UmbreonsPapa Just wanted to acknowledge that I am a fellow Massachusetts resident. Small world. And people wonder why the Switch was so hard to find. @westman98 Oops, must've missed that. I'd like to know - since when? GfK released a subscriber-only report about the UK gaming market in 2017. A subscriber shared the info that the Switch had sold above 500,000 units by Week 52 of 2017. The figure could be (and probably is) much higher (like >550,000), but that's what's known. It makes sense. Mario Kart 8 Deluxe, Mario Odyssey, and Zelda BOTW have each sold over 300,000 copies in the UK by the end of 2017. If their attach rate in the UK is similar to their attach rate in the US (50-60%), the Switch should be sitting at 500,000-600,000 units sold by the end of 2017. @westman98 So the Switch is doing well in the UK too then! Great! It is also the first time in about 6 and a half hears I have seen any sort of Nintendo at my local Sainsbury's, so shops actually want to stock it! I suppose Odyssey sold me on the system. But I only really bought it now because of that amazing Amazon flash deal that you guys posted. Otherwise, I probably would have held off due to the great catalogue of games that I already have to play. @tanookisuit Holy cannoli that's a lot of data!!! Thanks for that, it's what I was looking for but couldn't find. If I let myself Id' spend hours looking at it and drive myself mad (I was a sociologist/statistician in a previous life). I'll give the data it's due and say it's "close enough" as I don't believe any historical data of this magnitude is ever going to be 100% accurate anyway. Given that the 12 month periods probably never ever match up to the console launch dates, the GBA actaully works b/c in it's first 10 months it looks like it outsold the Switch by a significant margin of about 2m as it sold 7.5m it's first 10 months (June 01 - March 02), which is why Nintendo seems to be a bit hush hush murky on the particulars. I could be reading that wrong but oddly enough GBA is the 1 system we can get 10 months sales for due to it's launch in June. 7.5m is a pretty crazy number compared to everything else launching so much lower. I don't really follow their handheld line all that well but I'm guessing GB owners where lining up for GBA and somehow Nintendo managed to produce that many. They should have put some of that effort into NES Mini. Typing Nitnedo the way I do is a typo, saying Switch has outsold PS2 lifetime sales in Japan in just 10 months is a fake news lie. So no, not a typo. As for being pedantic, well Wii U outsold Game Boy in Japan but nobody ever reports on that. No wait, maybe that's a typo. @rjejr The GBA was about 10mo you're right, but it also cost $100 vs $300, and the games were all like $20-35 on average ranged too. Switch is a hybrid handheld and games are $30-60 too. The same guy who bought a GBA for $100 had nearly a dozen games to buy as a choice when it arrived mostly around $30. Think of that a moment — Switch $300 + a game would get you $360 before taxes. GBA with a game would be around $130 before taxes. You could spend the money up to the value of a no-game Switch and have a lot to do so that is a factor in moved units as well. Budgets break people and a handheld at 1/3 the price with games at around 1/3 the cost will move faster/better. And yes GBA lived off the strength of the Nintendo hype of the era and insanely solid Gameboy namesake and sales. Couple that with a broad well laid out selection of games at launch and in the months of that first year after would make most franchise lovers blush. The day it came out you had a Castlevania SOTN clone, Super Mario Bros 2 redone, a new F-Zero, Rayman, Chu Chu Rocket (twice the maps) from Dreamcast, Tony Hawk Pro Skater 2 (with 3D modeled characters on isometric maps), 3D space (sprite scaled) shooter, other platformers. GBA sold like crack because third parties threw the kitchen sink of notable names at it, they didn't pull the wait and see Switch got because of the WiiU being a colossal mistake. @rjejr Its quite easy to type lifetime sales instead of lifetime in 10 months sales. Jesus christ man. Youre discrediting something Nintendo themselves put out because one author on one site made an error with a link to another story. Another story that I might add Nintendo themselves didnt reference for this release but the author put in as a link to another article for users. Seriously? This is the hill you want to die on? Finding a release from a multinational corporation disingenuous because of an error by a writer on a site reporting the news? This may be rich coming from me, but grow the **** up. That's dumb and you damn well know it. @Marios-love-child Dude the gaystation is down to single digits sale in many regions specially in japan. That's poo is obsoleted and dead. @tanookisuit GBA only being $100 would certainly explain why it sold faster than the Switch, but it doesn't explain why Nintneod left the word "home" out of it's tweet about Switch being the fastest selling console ever in the US, when it wasn't, GBA was. @YummyHappyPills "Its quite easy to type lifetime sales instead of lifetime in 10 months sales." Know what else is easy, proofreading an article before you publish it. (You being the guy who wrote the article, not the you you who wrote the comment.) Yes, I'm the guy who needs to grow up, the guy who doesn't want to read an article saying the Switch has outsold PS2 in Japan when it clearly hasn't. I'm such an evil horrible person asking that an article gets proofread before publishing and asking for it to contain the truth. The truth is evil, I know. Fake news. Sorry I questioned something I read on the internet, I should just take it all as truth. Except when I'm told it isn't by people like you who know better. @YummyHappyPills Man, I just saw all the fun you've been having over at PS recently. My apologizes for arguing w/ you in this thread. There's a reason I don't go there anymore. @rjejr It's all fake news! Bwahahahaha! To be honest, as long as it isn't hurting anyone (See: Zoink games and 34BigThings for recent events of false info hurting them) then I just laugh about it really. No one is flawless. But that feeds into the issue that the correction is historically seen by fewer than the initial mistake. So it's a horrible thing. @YummyHappyPills Don't get me started on the fake news or real news. I can't even say on here what the President of my country is saying, and bragging about, and denying saying b/c he probably can't remember saying it b/c it happened more than 12 hours ago and his dementia is probably worse than mine b/c he's older, b/c it will get me banned.